The release of the film Mission Impossible: Ghost Protocol in December this year will be by some margin the UAE's most high-profile movie moment to date. 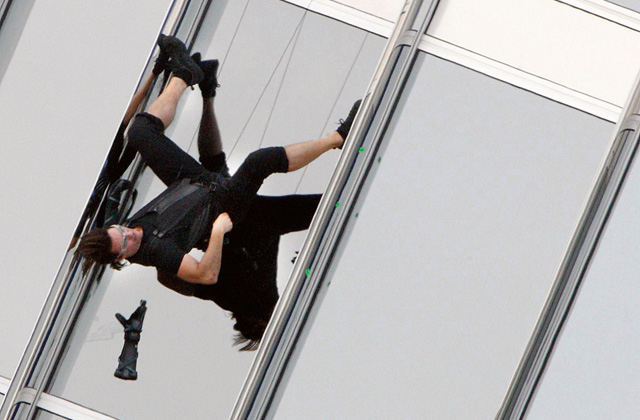 If the world's cinema-goers don't know much about the country now, they will after watching Tom Cruise abseiling across the mirrored windows of the world's tallest building. 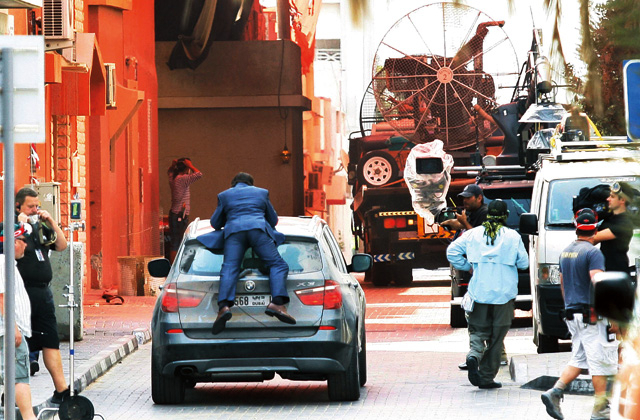 Ghost Protocol, partly set in Dubai, is proof of the UAE's cinematic ambitions to lure the best film-makers and movie franchises to the country. However, the UAE is also getting pretty adept at nurturing its own talent. For anyone based here wanting to pursue a career in the film industry, whether they want to be an actor, screenwriter or agent, there is plenty of reason for optimism. We asked several people representing various sectors of the industry about the roles they perform within the industry and what it needs to do to progress. Saro Carlwig, a Los Angeles-born legal graduate with over fifteen years' film industry experience, along with her business partner Ahmad Arshi, an Emirati novelist and screenwriter, launched the Talent Casting Agency for Emiratis and Arab filmmakers in February 2011. The film industry needs a structure to function properly and smoothly. For example, when a client is looking to hirea writer or a director for his project he needs to know where to find them, and that's when a talent agency is necessary.We realised there wasn't such an agency here in the UAE and therefore Ahmad andI founded Talent Casting Agency. We went to the Cannes film festival in May 2011 and introduced our talents to the international producers. We got paid jobs for our writers and actors and continue to work on getting jobs for our directors.We are packaging our writers' anddirectors' movies and we are presenting them to investors. In order to grow, the UAE film industry needs to go back to basics and invest its money and not spend it in partnership with companies who are not based here and don't care about the local talents. The UAE needs tax incentives and a film fund that can be invested for local and international films which are produced locally. Initially an artist and illustrator,Ashraf Ghori has worked as a 3-D animator in Dubai for several years. I started off doing Levity Xero Error Minus1, a totally independent film with limited in-house resources and friends. From then I've seen the film industry here grow steadily from a handful of faces to quite a few new ones. New initiatives and support here for upcoming filmmakers, coupled with the easy availability of equipment, have encouraged new talents to try their hand at film-making as a possible career choice. After Xero Error I was involved ina few film projects, notably Malal, the first Indo-Emirati production, and Djinn, a high profile horror movie from Imagenation, due in 2012. Surely these are signs of a growing industry. However, filmmakers are stilla minority and for a proper film industry to naturally evolve here, it will take time. Film-making should be made more easily accessible to a wider crowd, by creating hubs where such support is easily available or by offering support and encouragement to all residents, Emirati and non-Emirati alike, through specialised organisations. Any issues which deter this growthmust be identified and dealt with inan open-minded way. Former Los Angeles acting and directing coach, Miranda Davidson first came to Dubai nine years ago and knew that she eventually wanted to set up a facility for aspiring actors here. She achieved that two years ago with Miranda Davidson Studios that holds acting workshops. I fell in love with Dubai years ago andknew there were so many stories unheard by the world that needed a platform. However, when I realised the acting level of the people living in Dubai [and that they] needed a greater education in this fieldin order to truly bring those stories tolife on a global scale, I decided to put on some gloves and dig as deep as I could into the hearts and souls of the communityto try and bring as much of it as I could to the surface. There have been huge strides forward in the improvement of the talent as well as the will, morale and motivation to create. I would say the biggest factor in the improvement is that the willingness has increased tenfold. That said, there is no room for arrogance because we still have a lot of work to put in. I think we are just scratching the surface but the future here looks bright. To be good at anything takes work. Work every day on your craft and don't ever give anyone an excuse to not hire you for a role. My second piece of advice is "work begets work". Create things for yourself. Make your own shorts, plays, features and so on and don't focus on the outcome, focus on the journey and have faith that if you do your reward will come. Dare to dream and don't give up on making those dreams a reality. Omar Sami, born in Egypt to Albanian parents, is the executive producer and head of production at Eye-Squad, a film production company based in Dubai. I moved to Dubai in 2006 as it was emerging as a media hub in the region.I teamed up with the founder of Eye-Squad in 2007 and we started the film production department in the company, which is now among the biggest in the UAE. As executive producer and head of production, I closely oversee the operation and execution of all film productions, including fiction, documentaries and TV commercialsand promos. When I first got here, there were no feature films being shot in the UAE at all. Those were the golden advertising days during the real-estate boom. After the global financial crisis, the lack of jobs in the market meant people had more free time and they started to get more into fiction, shooting music videos and documentaries, and so on. So the aftermath of the crisis included some positive consequences. Our SFX department has worked ona couple of movies lately, one was a known big Hollywood production and the other was Djinn, the forthcoming UAE horror movie directed by Tobe Hooper and produced by Imagenation. We also made an action film for the UAE Armed Forces which was very challenging to shoot. The most challenging aspect of film-making in the UAE is to be able to put together the right team for your production within the limited resources and talents available here (especially if it's fiction or drama) and especially when you compare it with other countries where film-making has a lot more infrastructure and facilities to rely on. The New York Film Academy opened its Abu Dhabi branch in 2007 and has since seen hundreds of its students qualify as film practitioners, says Imad Deiratany, the academy's development manager. Here at the New York Film Academy we teach film-makers how to write their story and turn it into a film through a hands-on intensive programme. Students are able to write, direct and edit eight short films and also work on about 15 group films with different roles. Our programmes balance the study of the craft with practical experience to train students to be the best filmmakers they can be. This is achieved by a rigorous schedule of classroom instruction, hands-on workshops, and immediate experience. The Abu Dhabi emirate has made a massive commitment to developing the film and television industry in the region. Among the projects launched by the Abu Dhabi Authority for Culture and Heritage (ADACH) are the Middle East International Film Festival, the new film studios in Studio City, a Middle East Film Fund anda National Film Commission. Already, we've seen a few of our Abu Dhabi graduates make the step into festivals and win a few awards. Other students have had the chance to work directly in the media industry in TV stations. A few students have started working on documentaries, music videos and as editors and so on, and a few actors have started winning roles, either in Bollywood (as Taaha Shah did in Luv Ka the End) or in feature film production (like Isa Swain in the supernatural thriller Djinn). JW Halloway started taking acting lessons last October and has been involved in small-scale productions in the US, Jordan and the UAE. The first thing I learned about show business was that "they" don't care much about what you've done long ago; they only care about what you've done recently. That initially did not bode well for a late bloomer like me, who missed my first opportunity to be in movies back whenI was in high school, and only started taking acting lessons when I turned 32 last year. But I have been involved in small-scale productions in the US, Jordan and the UAE for nearly ten years now, and whena talent scout recommended acting lessons to me, it made me stop and think. I just felt the need for a creative outlet in my life.I have completed several acting and scene study classes at the Miranda Davidson Studios, and most recently participated in an intensive workshop with Hollywood coach Michelle Danner. I see an increasing number of opportunities for UAE-based actors, and not just because Mission: Impossible 4 was shot here. There's a growing local and regional scene, and if everybody pitches in, we can create an industry for ourselves.I have just written a short-film script and I'm working with several friends to shoot it this summer for the first Tropfest Arabia competition in November. I moved to Dubai in 2004 after a few years of working in the biggest film and advertising post-production facilities in Bucharest, Romania. Despite having the best post-production facilities in Dubai at that time, it was a shock move for me. I soon realised how small the post-production market here was, and I didn't feel comfortable. However I was intrigued about this place and decided to give it a try. In 2009 I opened Abis Studio,a boutique post-production facility in Dubai Media City, and now I'm oneof the leading practitioners in the local post-production market. Also in 2009I was appointed as the editor and post-production supervisor for Ali F. Mostafa's film, City of Life. It was an honour to be working on such a high-scale production. I enjoyed it all, even though the needed support from the local industry was missing. Nowadays things are getting easier, since more productions are taking place. Also, the advance of digital media is helping a lot. Currently I am involved in the Imagenation's project, Sea Shadow, directed by Nawaf Al Janahi, as a co-editor and post-production supervisor, and the horror movie Djinn as a post-production supervisor. The number of local film productions is growing constantly, but we won't be able call it an industry until the government starts subsidising the cost of producing films."